This page created 26th February 2011, updated 25th October 2016. With Marshall no longer producing bus bodies, First needed another supplier for its ongoing program of replacing step-entrance Darts. Their choice alighted on the 10.5m Caetano Nimbus, seating 29 with dual doorways. They were to be divided between Rainham and Uxbridge, with the 2003 spring deliveries to Rainham, and the autumn 2003 deliveries to Uxbridge. 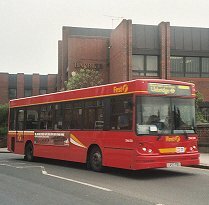 The Rainham buses (492-525) began to arrive in March 2003, with deliveries continuing through to August. The first deliveries were due to work on the 364 and 499, although from the start they appeared on the 165, 296 and W19. They also began to appear on the 179, 252 and 365. September 2003 saw new DHLs arrive at Uxbridge, initially on U2 and U3, and then on A10, U1, U10 and 331 as well, alongside Marshall-bodied DMLs. 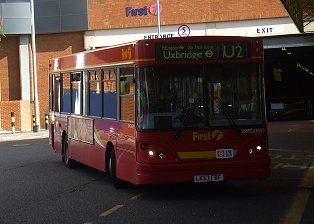 U2 Uxbridge Stn - Hillingdon Stn - Hillingdon Hosp. 331 Uxbridge Stn - Denham - South Harefield - Mount Vernon Hosp. - Northwood - Ruislip Stn. Uxbridge Station, April 2004: DHL530, 531. First began its National renumbering scheme during 2004, and these buses, like the other London Dart SLFs, had 41000 added to their fleetnumbers. Except that someone messed up. A new batch of Darts somewhere else were given numbers 41515 to 41519. When the error was noticed, rather than renumber those new Darts into the correct numbers for their local scheme, the London Darts were renumbered 42515 to 42519. For some reason the fleet type (unique to London), was altered from DHL to DMC. The new numbers began to appear gradually, quicker at Rainham than at Uxbridge. The Rainham and Uxbridge contingents stayed put (with the exceptions that 522 and 527 swapped locations in July 2004 for some unknown reason). 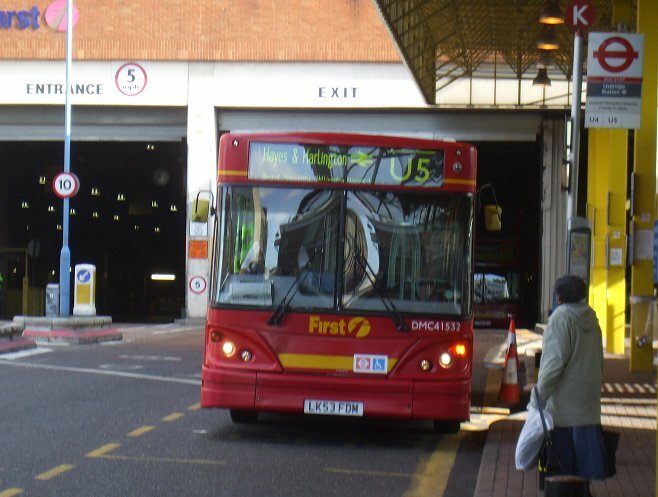 But in December 2005 Rainham was closed, and its stock and routes, including all the Rainham DMCs, were transferred to the new Dagenham depot. Uxbridge Station, October 2008: DMC41529 on U2, DMC41532 on U5. 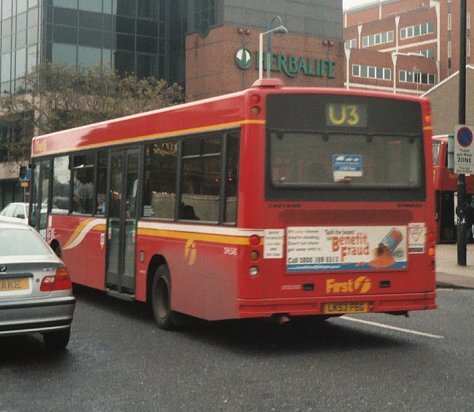 But from 2008 the Dagenham buses started to move westwards to Uxbridge, displaced by new EnviroDarts. Some went to Greenford in March 2009 when the 195 was suddenly dumped in First's lap, but their sojourn there was brief. 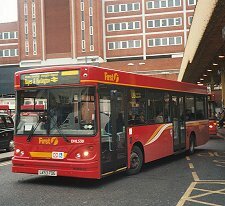 They began to go into store at Hayes, being reinstated as required while new buses were being acquired for new route contracts. 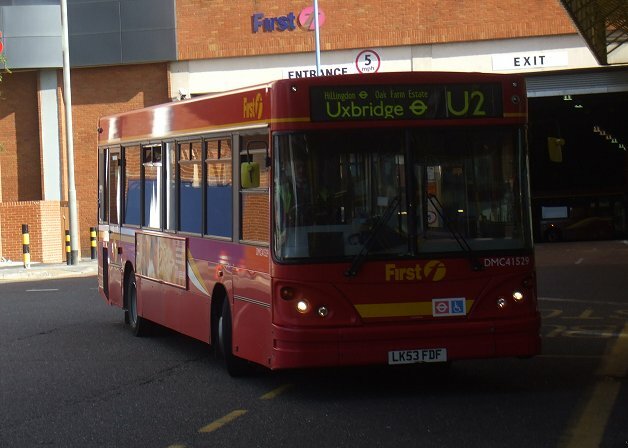 The Uxbridge batch continued doing their original roles, until the influx of newer buses started to put these too into store. The depot at Lea Interchange acquired a significant number of them in 2009/2010, to replace older Marshall Darts on the Stratford area routes. In the summer of 2012 the DMCs that had remained in east London were mostrly dispatched to the First disposal pool. The Olympic Games brought a brief change of scene for four of the class, three of them reinstated from store: they were used with conductors for a supplementary free service on the 108 (Lewisham - Stratford) to assist Go-Ahead with enormous loads through the Blackwall tunnel to and from the Games. In June 2013 First Group pulled out of London operations, dividing its fleet and property between Metroline, Go-Ahead London and Tower Transit. Those DMC SLFs at Uxbridge, twenty of them (DMC41503-41511, 41526, 41528-41537) were taken on by Metroline, who promptly allocated them numbers within its current numbering scheme involving type codes and an overall fleet number. They became DC1540-1559. They were withdrawn in late 2015 or early 2016, and sold to Ensign Bus. Seven of them were bought in August 2016 by Swallow Coaches of Rainham for their EOS business. Four DMCs at Lea Interchange (DMC42515-42518) were taken over by Tower Transit. They remained in service until October 2015, after which they went on loan to Whippet in Cambridgeshire. Ian's Bus Stop Dart SLF index. DMS, DM, DML text. DHL histories. photo refs.